Video: Pole-Shift Safe Locations for the Pacific Northwest, Radiation exposure and Volcanoes. In this video, I explore mainly Oregon, Washington State and Vancouver Island for safe areas to survive the Pole-Shift. The critical subject of west coast volcanoes (Rocky Mountains) is covered and it’s all-important companion-subject, prevailing winds. Radiation exposure from nuclear stations is also covered. For an in-depth article on radiation exposure, it’s highly-complex graduated measurement, it’s dispersal and living with radiation from an After-Time perspective, please go here to find links to my Planet X NewsLetter (2015) Issue #2 The effects of the Pole-Shift on the Pacific Northwest coast line is also discussed. As usual, I draw on ZetaTalk for most of my base information. Here is a LINK to my blog post on Issue #2. I’m hoping to eventually complete a closer examination of the North American continent by a few states and Canadian Provinces at time. Dude… I’m sure you have great info, but it takes you so long to complete a thought I can’t stay engaged enough to wait. You need to cut down on the side remarks, stay on topic and speed up the pace a bit. You’re 18 minutes in before starting on the subject of the video and ramble on about volcanoes for a whiiile. Statistically most viewers only watch for 3-5 min and we don’t need to see mountains of footage to prove how powerful volcanoes are; the general population already understands this. Only one line needed: “you generally want to be X miles away from the base” or whatever. I stopped watching here so don’t know what else was covered, but didn’t come away with any useful info. 2. The quick answer boiled down to key points i.e. “see this map? Here are the likely safe areas in the Pacific Northwest. See this other map? Those are going to be likely dead zones. This other map shows you iffy areas that could go either way. 3. Now I’m going to tell you why each area was designated as such, so if you find yourself traveling you will know what to be on the lookout for. We’ll talk about volcanoes, wind, nuclear blah blah. Don’t wait to divulge the info they clicked your link for. Front load it, then explain long form if you must. Just like an essay, state your thesis, summary outline what you’re going to discuss, then be sussinct while doing so. Hi Kristina. I appreciate your comments on how to make a video, but clearly, you have no idea of my limited resources and time. My videos are not to entertain and yes I am aware of the modern, time-consuming methods that require more equipment and manpower to produce. I suggest you pay more attention to the content than that of style. I couldn’t make it to the actual content of the video. That’s the point. I found myself skipping through to try to jump around looking for the meat of what you’re trying to say. I can’t be the only one. They have lots of experience making videos I thought I would take a moment to give you some feedback. I rarely do that. I don’t always handle unsolicited advice well, and realize it my post might seem a little… Insulting. Please know I only made it because I thought you were content deserves to be heard and wanted to helping the only way I could. Feel free to disregard it, however these methods will help you record your videos quicker and more efficiently with less resources while also increaseing viewer retention and ultimately your message will be heard better. By more people. Thank you for your advice, Kristina. This is an older video, so I was just getting started in 2015. Agreed that I could do better anyway. I know I said this before, but the work required to do the study, the custom maps and integrating the zetatalk info and my own channelled info into a video is monumental, especially when you consider that the advice has to be as good as possible as the lives of people are at stake here. Yes, I have people that just do what I suggest without doing much research, I’ve had many conversations over the phone about their next step, buying or selling property, where to move and how to situate etc., so I take the info very seriously. As far as I know, nobody is doing this work in the way I am doing it. Of course, I get many more thank yous and positive comments about my videos than those who see the flaws or have particular ways in which they take in visual/video content, which I suspect you have, yet my methods have a madness to them: I want the viewer to see why I am suggesting locations and not just a location. This is because the forces at play are planetary in scope and a lot can happen and much will happen that can’t be said beforehand, so the more they understand what the ground and the sea water is going to do, in my viewpoint, the better. Currently I am working on Brazil (200 + million in population), so potentially a million people or more may take my advice! 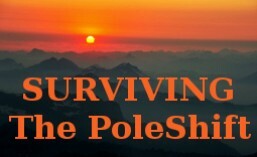 Can you imagine giving say even 50 people advice on how and what to do for the pole-shift? If 30% survive, that means whole genetic lines of families will live on for centures into the after-time because of my advice. Having said all the above, I’m planning to do lots of cuts in the next video eliminating all my pauses, ums and ahs, I believe this will move the video forward and help to stave off the complaints I get about the pace of my videos. I know that today’s public is much more discerning about their video content, I know I am. Absolutely, your work is much appreciated and crucial. I hope you reach as many people as possible. Unfortunately most are in grave denial despite the scientific evidence. Remember that people like myself spent countless hours researching as well so something as simple as a short rundown of locations you’ve identified at the very beginning before getting into why helps a great deal. Even opening with a display of maps while talking about something else would do it.